Animation retelling the story of the nativity from the point of view of a young cow living in a stable in Bethlehem. 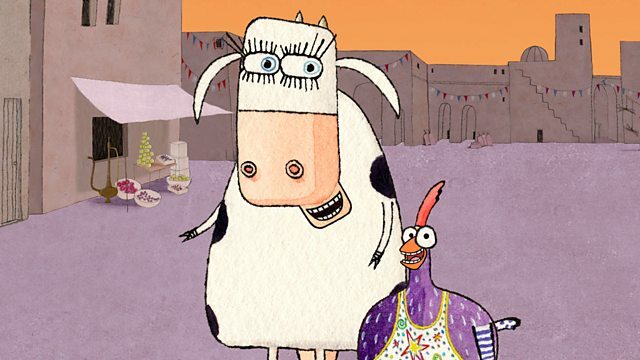 Animation retelling the story of the nativity from the point of view of a young cow. Marjorie lives in a run-down stable in the middle of Bethlehem, an unremarkable backwater town only a few days donkey ride from Nazareth. Bored of her small-town life and stable where nothing ever happens, Marje gets permission to go into town - which is unusually packed with every creature under the sun, from panda bears to elephants, all having returned for the weekend to comply with Caesar Augustus's Roman census. Convinced there is going to be a party, Marje stops travellers to ask where it is happening, but none are much help. A herd of sheep have never heard of the census, and a donkey isn't looking for a party - all he wants is a rest having lugged his boss's heavily pregnant wife from just outside the Nazareth ring road, only to find they haven't even booked a hotel. And as for the camels hiding in the rubbish dump - they get Marje chased through the back gardens of Bethlehem by local prefect Pontius Pilate's horse guard, who are on the hunt for three star-gazing, wise astronomer blokes the camels have carried all the way from the eastern deserts. Escaping by the skin of her teeth, Marje is fed up and lost. The census party has been a massive disappointment. But then she catches sight of the bright star the camels mentioned they were following, and follows it to find something very special.